After exploring Buffalo Bayou Park a few weeks ago, I knew that there was more to see than just the park proper. 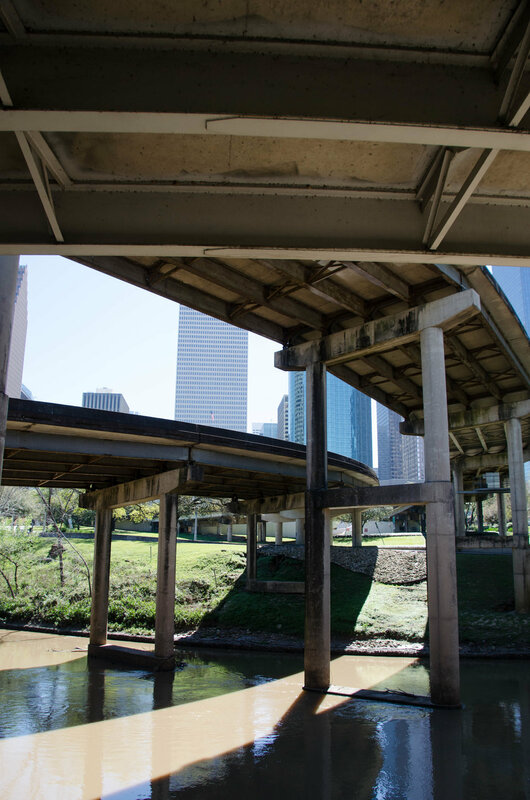 The pathways on both sides of the bayou continue in to downtown Houston, which I thought held the promise of a brand new perspective on the city. I was not mistaken. Seeing the highway from underneath was a much bigger wow experience than expected. I thought this part of the walk might be a little colorless and dreary, but that was far from the case. The massive columns that support the highway create a shadowed and beautifully symmetrical forest of concrete. Overhead, the metal framed undersides of many lanes of traffic let you see the highway in a whole new light. Somehow, what seems huge up above seems small down here. This world is an urban fantasy land and a photographer’s playground. 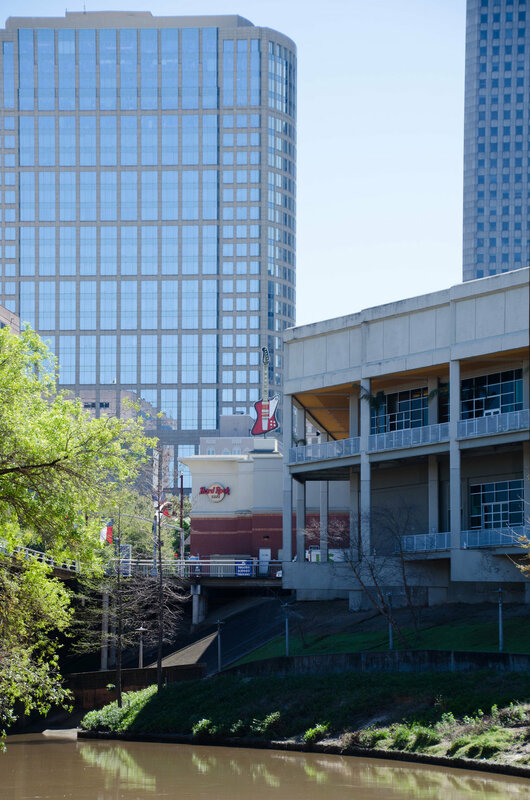 From the path on the northern side of Buffalo Bayou, you’re close enough to the city to enjoy the way the huge glass clad structures serve as oversized mirrors for multiple city blocks. Trying to find the best angle for capturing as many reflections as possible turned out to be a fun challenge. The benefit of this vantage point is that you can see a lot of detail while still being far enough away that you can fit a relatively large area into your field of view. 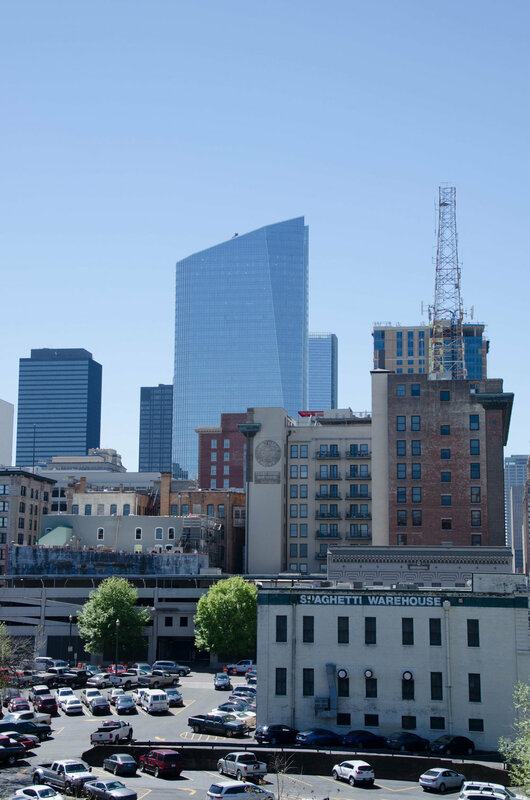 Once you reach Main Street and turn toward the city, you will be looking out over the oldest area of Houston. 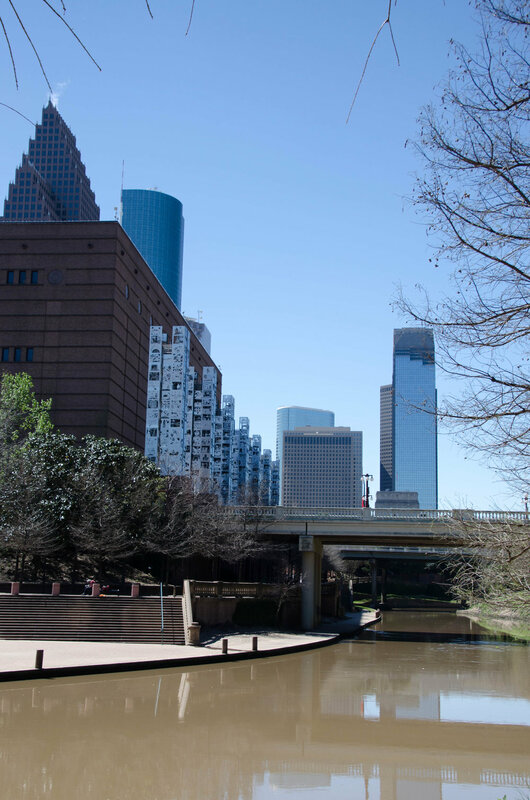 The docks built at Allen’s Landing, where Buffalo Bayou joins with White Oak Bayou, were the reason Houston came into being in 1836. Here, ships coming up from Galveston Bay had an area wide enough to turn around before heading back out to sea. 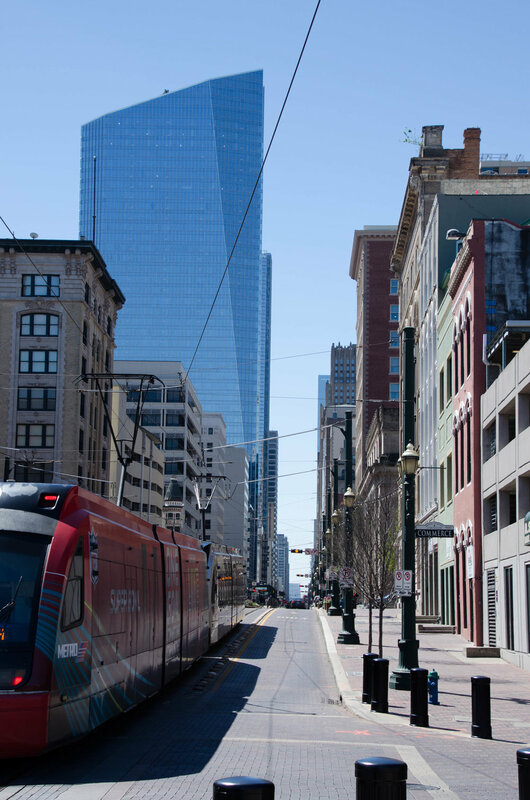 As a contrast to the towering high-rises in the rest of downtown Houston, buildings here are more warm and welcoming in scale. It’s certainly an area that invites you to stay a little longer. Fortunately, you won’t have any problems finding a nice place to eat. 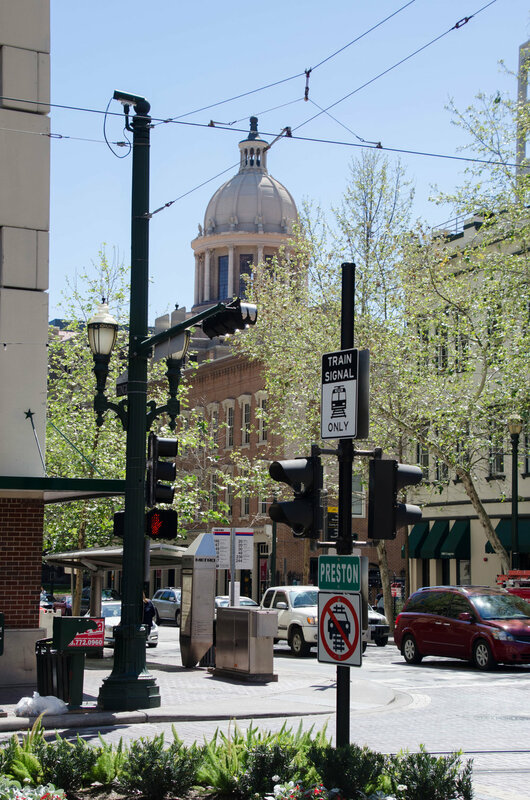 Bars and restaurants are plentiful in this area. In fact, there are so many options that you could pick a new place every time you visit. Unfortunately, there’s not much else to do here but eat and drink. 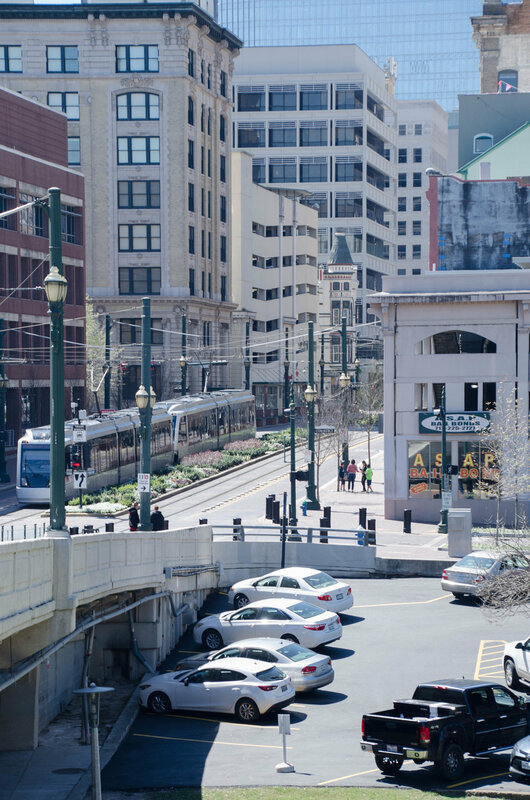 This area would seem ideally suited for pedestrian streets with a nice mix of shopping and restaurants. 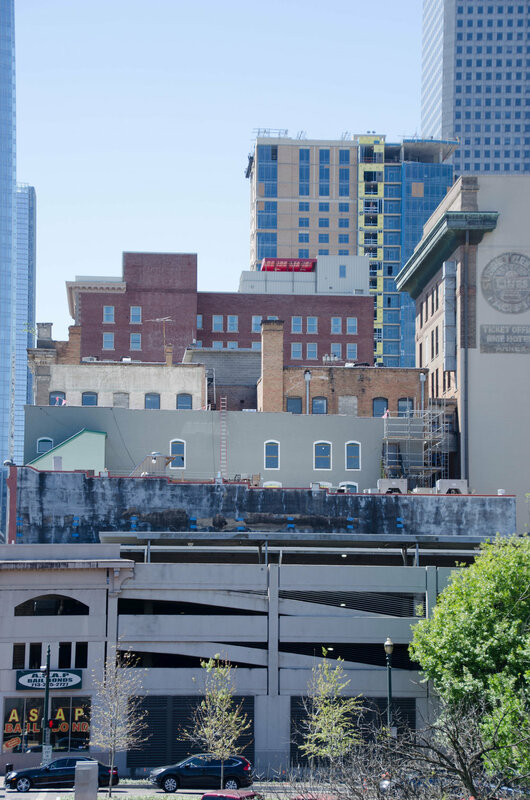 My hope is that with the increased focus on creating people friendly places in the city, it’s only a matter of time before we can spend an activity filled day strolling through downtown Houston. The Honeymoon Cafe and Bar offered a good meal and an enjoyable place for a rest. 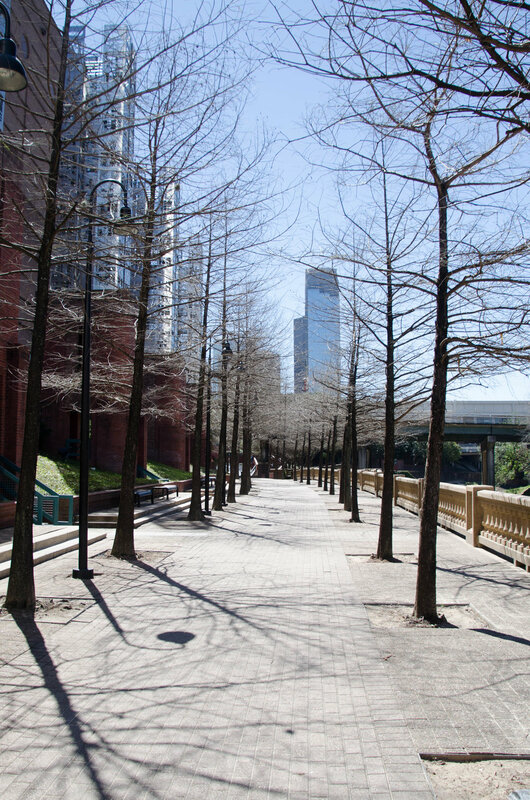 On the southern side of Buffalo Bayou, you’ll find a welcome scattering of parks. 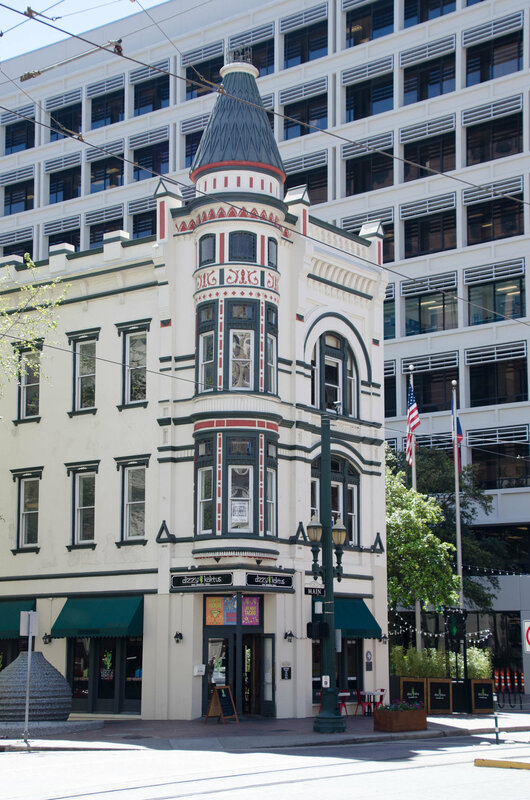 Closest to Main Street is Market Square Park, once the home of Houston’s City Hall. The first City Hall on the site, built in 1841, burned down in the 1870s. After being rebuilt, it burned down again in 1901. Some years after rising from the ashes a third time, it was decided that a larger building was needed and City Hall was moved to its current site in 1939. Three blocks west of Market Square Park, you’ll run into Sesquicentennial Park with its seven impressive pillars lined up in a row along the bayou. 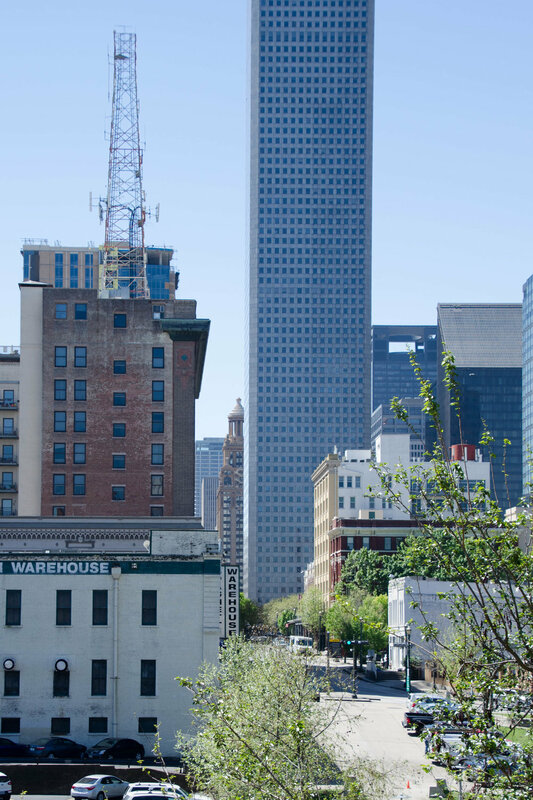 The pillars are 70 ft tall and depict Houston’s history. Between the pillars and the bayou is a pathway lined on both sides with cypress trees, which probably provides some very welcome shade in summer. The park’s focal point is its large water fountain. 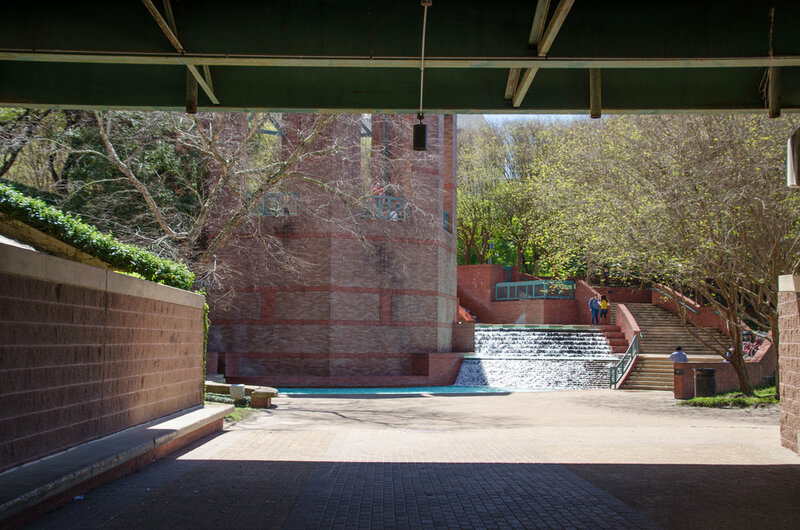 The water flows along a spiral path from street level down to the pathway area. Continuing on a few more blocks, you’ll enter Tranquility Park with its tall cylindrical fountains set in large pools of water. 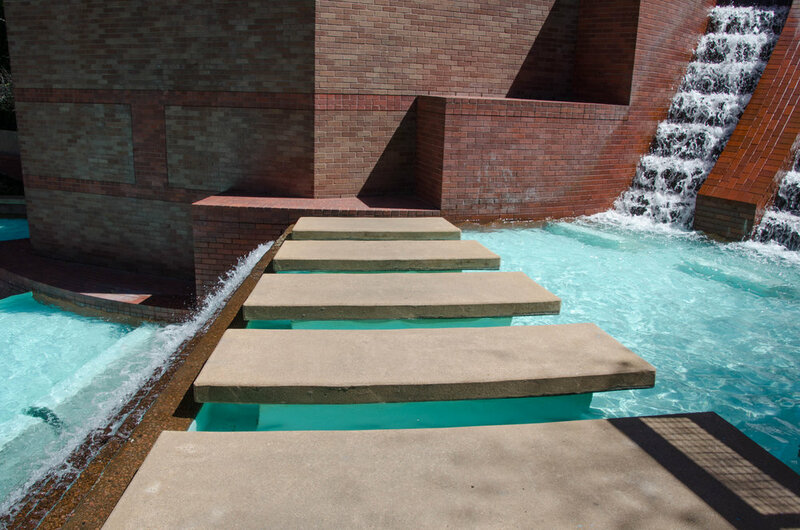 Houston clearly knows how to use water to camouflage the heat of the summer months, or to provide relaxing views the rest of the year. 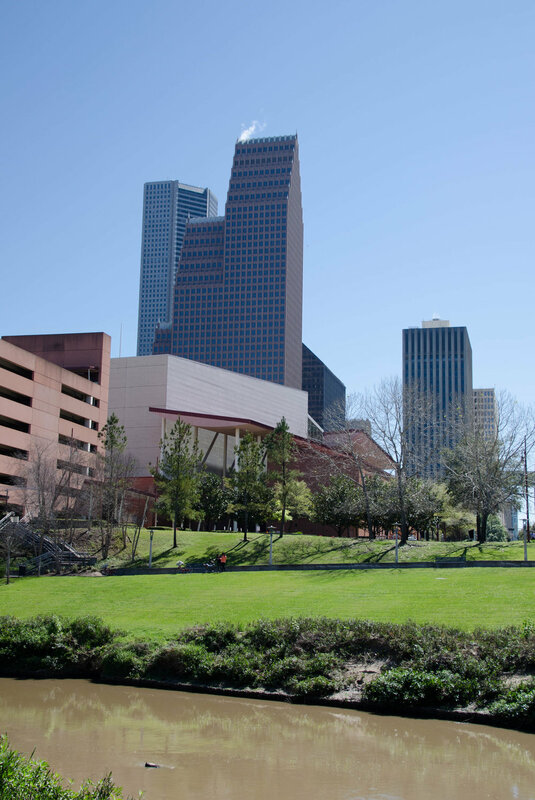 The Hobby Center, located between I-45 and Tranquility Park, is a personal favorite Houston destination. Through the years, I have enjoyed numerous memorable shows at this venue. I first noticed the historical buildings at Sam Houston Park twenty years ago. Every so often, as we drove past on I-45, I would tell myself that we should take the time to stop and have a look. After 20 years on the to-do-list, I’m proud to say, it now has a check mark next to it. 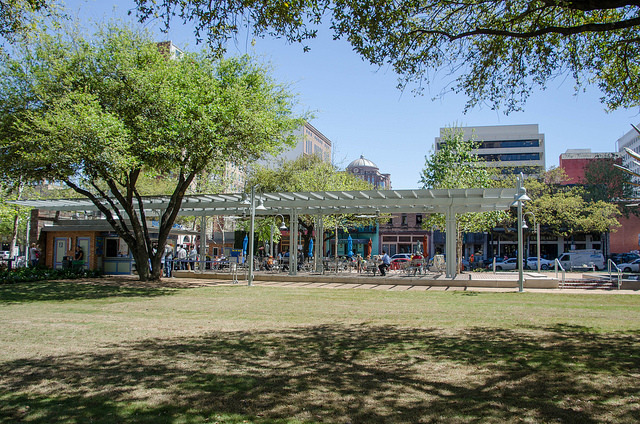 This park will provide you with one of Houston’s most iconic images. In the middle of the park sits a little white painted church. It’s the type of church you can easily imagine sitting all alone in the middle of a prairie in the mid 1800s. 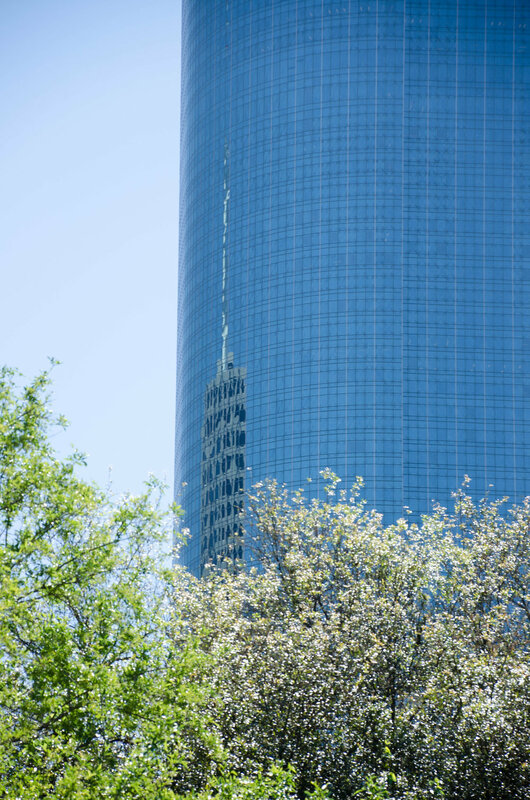 Today, it sits in the center of Houston with towering modern structures looming behind it. How the world has changed in 150 years! Also in Sam Houston park, you’ll find the 1847 Kellum-Noble House, which is the only structure in the park original to the site. This house was built only a decade after the founding of Houston and was part of the purchase when Houston bought the land in 1899, with the intent of creating Houston’s first municipal park. There are several other homes in the park that have been moved from other areas of Harris County. There’s also a nice little pond at the lower end of the park. 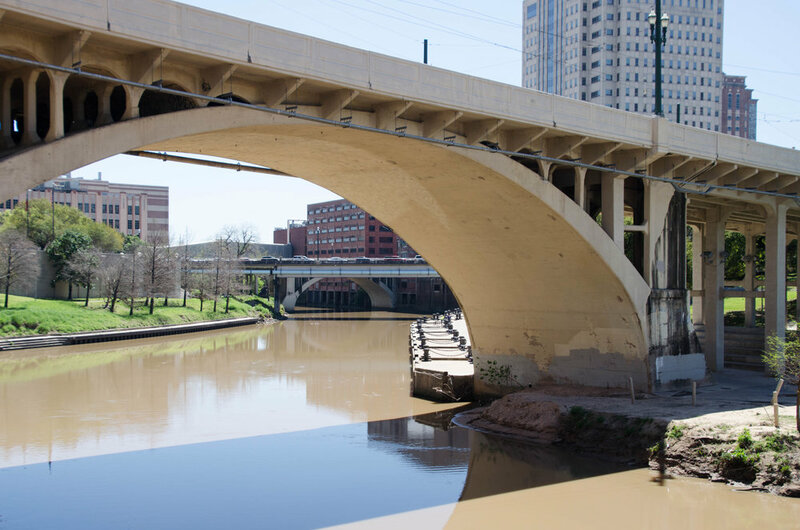 If you decide to go explore along Buffalo Bayou after reading this, or you already know the area, I would love it if you left a comment with your thoughts! Mar 31 The Smiles will Come at Smither Park.